We’ve given into the inevitable and expanded the course to four days instead of three. I’ve been doing a four-day format in Italy for a couple of years now, and with all the new stuff that’s been introduced I no longer feel comfortable jamming everything into three very long days. Since this is a hands-on course, the absolute limit is eight students. Lectures get followed by sets of exercises, following which the results are compared side by side. This process is known as “the evaluation” in North America, “il bagno di sangue” (the blood-bath) in Italy. Whichever term you like, it’s perhaps the most important part of the course. If I tell you that your work is unsatisfactory, the tendency is not to believe me, because your work does look much better than the original. But if you can see with your own eyes that six people have done better with the same image then there is no room for arguments or hurt feelings, but only for a consideration of what errors you made that caused the problem, or what techniques the others used that you unwisely omitted. Naturally, the emphasis is on PPW and related techniques, yet the entire first day is devoted to “traditional” methods, and CMYK at that. Without that foundation, nobody can get full value out of PPW, and with nearly 40 hours of class time to play with (the days are long ones, but not the 12-14 hour ones that occasionally happened in the three-day format. The final day is programmed by the group, which can propose its own images to work on if desired. I have taught this course more than 200 times now, never the same way twice, continually showing improved techniques, so this slight change to the format isn’t going to be a problem. It’s a physically demanding experience and a strain on the mental processes, but it’s also a pretty good thing for the career, a source of new friends, and generally rewarding emotionally. If you’d care to join us, all the details can be found here. Hi, Dan. Just wondered what version of PS you will be using for this training and do you also touch on the use of what seems to be the current rage, Lightroom? Thanks for any thoughts you may have to add. Robert, students can use any version of Photoshop that’s installed on their workstation. Right now, I suspect that only CS6 is there because I don’t believe that Photoshop CC has yet been rolled out to training centers. For my demonstrations I expect to be using CS6. We don’t cover Lightroom because many if not most students don’t have a copy of it. In any event there is no need for it in this class because from the color correction POV it is equivalent to Camera Raw, which we do cover. Will you be bringing your MPCW training to Toronto in the near future? ps been a few years, think I need a “refresher”! Toronto is a great city, except for its hockey team, but unfortunately there are no current plans to return there. Thanks for your interest. I’m really looking forward to 4 intense days of learning, practice and critique. Work and personal commitments changed my focus since I took the advanced ACT class in 2004. That and the original ACT class were the best, condensed learning I’ve experienced in this line of work. I’ve benefited immensely from the techniques and principles both professionally and personally, but hadn’t been keeping up on all the latest on the Color Theory list until recently. I’m doing my best to catch up now. I’m two-thirds of the way through the new book, practicing as I go, and I’m blown away by all the adjustments and advantages to the newer approach and PPW panel. Thanks for continuing to push and evolve the process, Dan—and for scheduling the latest classes! My good friend Doug Kaye and I are just back from the San Diego session of Dan’s four day ACT class. This was such a great experience – an intense four-day Photoshop “retreat” with Dan. Using a combination of lecture, challenging us with questions and image correction by students followed by critique, Dan kept the focus on our learning. If you can go to the upcoming Houston ACT session, go! I can’t recommend this experience more highly. I was happy to see that you ran your class last year and I was super frustrated that work commitments blocked me from attending both times. any chance you will be running other seminars this year. I have read several of your books and your thinking has very much informed my workflow. The ideas are not always so easy to grasp so it would be a privilege to be able to study with you directly. I will keep my fingers crossed that you decide to teach again this year. Thanks for the kind comment. We haven’t yet made any decisions about classes this year. Likely there will be at least one, and I would guess it would be in California in the fall. We’ll post information here and at http://www.ledet.com/margulis. The classes are an excellent learning experience, but they’re also rather intense. I couldn’t find anywhere else to put this comment so I’m putting it here. Unfortunately New Zealand is a bit far to come to any of your classes, so I’ve been an avid reader of your books since The Canyon Conundrum – I’m 67, a photographer & multi-media artist (& ex-scientist) & would describe myself as an intermediate Photoshop user. 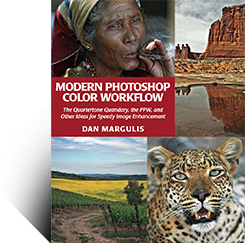 My comment relates to p xxviii of Modern Photoshop Color Workflow, where you perhaps disagree with beta reader Adriano when he suggests going through the book first without actually being in front of a computer. I think it depends on the individual’s learning process. When I first tried “Canyon” just after it came out I worked along on the computer & I simply didn’t get any of it. I struggled, got very frustrated & finally gave up at about chapter 5. Several years later I had another go, this time just reading & giving myself lots of thinking time, & it all fell into place. I waited until I was about halfway through before starting to apply it to my own images. I’m doing much the same with the new book & finding it very rewarding. So for me there’s something about needing to fully understand the whys as well as the hows to be able to apply it easily. Possibly the difference between kinaesthetic (doing) & visual (reading/seeing) learning? Thanks Dan for another essential intelligent, not to mention relatively simple, colour correction method. I neither agree nor disagree with Adriano’s suggestion. Everybody learns in their own way. Some people are uncomfortable unless they fully understand what is being explained at each step of the way. Others, like Adriano, prefer a broad overview first. Adriano’s approach presupposes that the book is going to be read more than once. I don’t know how many readers are ready to make that assumption up front, although reviews of my other books may persuade them to do so. Obviously that wasn’t your assumption when you started Canyon Conundrum. OTOH, these two books are very different, in that the first chapter of Canyon Conundrum introduced something that many readers had never heard of, and invited them to do a simple test with their own files, which would convince them of the power of LAB. In MPCW only those who begin with Chapters 5 and 6 can get that kind of immediate gratification. The problem with Canyon Conundrum is that people didn’t back off once they took the first bite, and they ran into the same problem that you did of trying to harness LAB’s full power without really understanding it. In MPCW, the initial chapters are more difficult. I warn several times, and am supported by other instructors, that the color adjustments of Chapter 3 are the most difficult part of the book. Certain readers, however, disagree, and say that Chapter 4 is harder. Who is right? It depends on the individual. If you find Chapter 4 hard, it doesn’t matter how many people say that it’s easy. Similarly, many readers accept my invitation to skip around from chapter to chapter, and to ignore the second halves. Others decide to it as if it were a novel. If there really were one best way to learn this discipline, then everybody would adopt it and life would be much simpler. Failing that, the best we can hope for is people like you who explain how they fought off discouragement and found a way forward. Dan – thanks do much for your carefully considered response to my post. I’m now up to Chapter 10 in MPCW and am beginning to apply the “moves” to photos I took last year in Iceland and the Canadian Rockies – ideal candidates. The weather was mostly terrible yet the PPW is making my images really come alive.Your explanations of why the camera does not “see” what we do because of our visual adaptions and how making the corrections some months later also means that the final PP may even not be what we actually saw, but how we remember it, have been helpful beyond belief.